London-based studio Make has created some unusual cubicles inspired by the ancient Japanese craft of paper folding. Made from aluminum, the sturdy kiosks can be opened and closed just like an Origami fan. 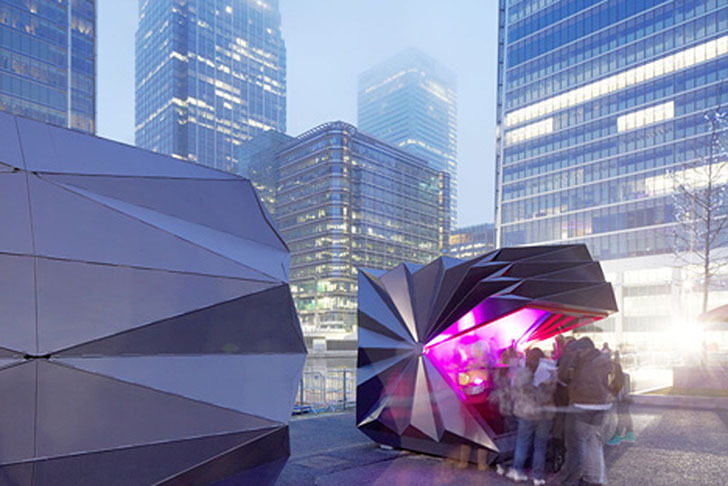 Prefab and portable, they have a variety of uses, but they first appeared as an Info Point in London's Canary Wharf. In order to develop these extraordinary structures, the London-based studio first made several paper models based on Origami shapes. The small humble designs were then translated into real life structures made from sturdy recycled aluminum in collaboration with Entech Environmental Technology Ltd. Designed with a variety of uses in mind, the kiosks can be used as a spot for serving drinks, a DJ cabin — or just like they were last month, an Info Point for outdoor festivals. Prefab and waterproof, the folded structures are made from hinged aluminum panels finished off with a resilient powder coating. The interior space that measures 6×10 feet is completely insulated and covered in plywood with a waterproof membrane. The kiosk opens and closes thanks to a counterweight system, and a winch raises the front from the base forming a canopy that protects people waiting to be served. MAKE try so hard to be relevant. Their non-hierarchy studio is a joke, and their projects even more part of an ongoing speculative architecture which never leads anywhere, what a waste of money they should refund their MAKE Hessian shoppers and all their customized accessories... it takes more than an empty identity to make a real presence!!!!! Why not try to be loyal to your team of architects who desperately try to MAKE you relevant!!!!! In order to develop these extraordinary structures, the London-based studio first made several paper models based on Origami shapes. The small humble designs were then translated into real life structures made from sturdy recycled aluminum made in collaboration with Entech Environmental Technology Ltd. Designed with a variety of uses in mind, the kiosks can be used as a spot for serving drinks, a DJ cabin -- or just like they were last month -- an Info Point for outdoor festivals. Prefab and waterproof, the folded structures are made from hinged aluminum panels finished off with a resilient powder coating. They are easily recycled or reused. 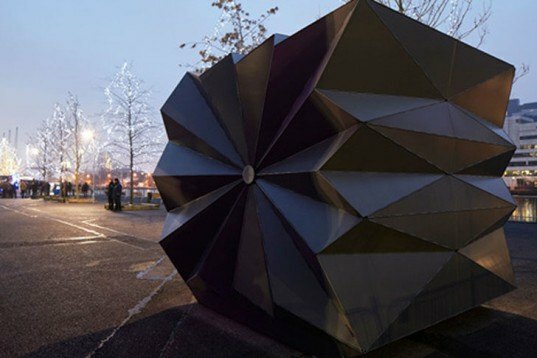 The kiosk opens and closes thanks to a counterweight system, and a winch raises the front from the base forming a canopy that protects people waiting to be served.